Beechmont – Windabout Rd Reserve. The World As I Am returned to Windabout Rd Reserve starting on the southern portion. With the assistance of the Green Army we were to treat the allocated sites prior to planting. These zones consisted mostly of Cobblers Pegs and juvenile Privet. To begin with The World As I Am conducted a workshop explaining the characteristics of Moth Vine, how it effects the natural environment and treatment techniques. While the Green Army was preparing for the day, all native vegetation within the planting zones were tagged to prevent any of these natives sprayed by mistake. The Green Army then stepped down the Cobblers Pegs to prevent drift from the application. Herbicides used in this zone were glyphosate and metsulfuron methyl at industry standard and a dye to mark areas previously sprayed. Anyone not assisting with the herbicide application began manual removal of Privet in a zone west of the planting area. These Privet were juveniles, up to a year old and given the volcanic soil were easy to remove. Once the planting area was treated the Green Army were spilt into two groups. One continued on the Privet, the other joined me to treat Moth Vine. The Moth vine was treated using the cut, scrape and paint technique. There were plenty present within that zone. Pods were collected and removed from site. The rest of the week we moved to the North Western portion of this reserve where Privet was the main target. The density was extremely high, mostly under 2 years old. Hand removal and cut and stump were the techniques implemented in this zone. Some chainsaw work was required on the mature species. And then there was the Rubus… Wild raspberry, what a nightmare. 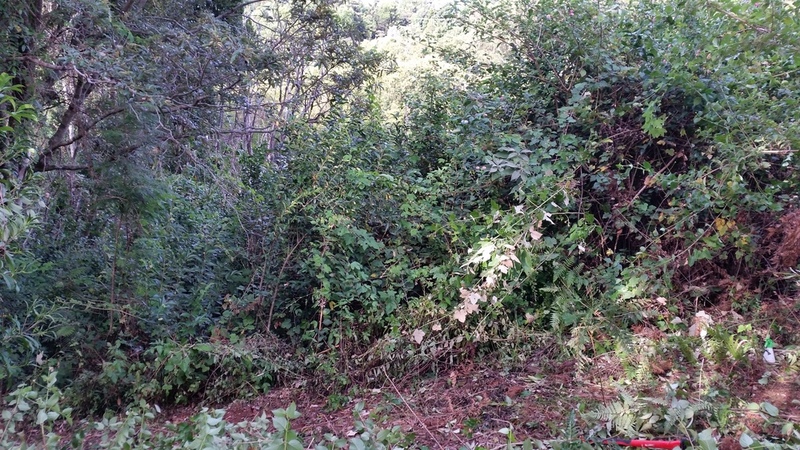 Trying to work under a thicket of Rubus was… challenging. But the job was done, with a great result. The native regeneration now has a chance to take back their eco system. They will require assistance but it’s a start. Works continue on this site in couple of weeks.